Germany-based G Data's Total Security premium suite has all the features you need in a well-organized app, with relatively fair pricing. Nothing says security and trust like German quality. At least that’s the pitch for Germany-based G Data. The company’s tag line is “Trust in German Sicherheit (safety).” The idea being that modern Germany is known for “solid German quality” and its strict privacy laws, which G Data must adhere to, thereby shielding its customers from breach. Besides that, G Data has also been doing antivirus protection for a long time, and its current AV product relies on not one, but two detection engines. While it may not be a common name to North Americans, G Data has been on the AV scene since 1985; the company even claims to be the world’s first antivirus outfit. 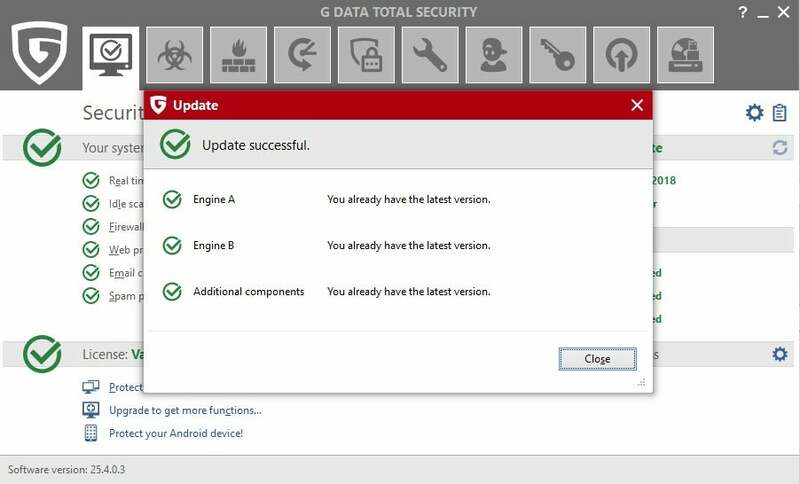 G Data Total Security uses two malware engines. Similar to other legacy security companies like McAfee and Symantec, G Data maintains a fairly well-organized suite. Its top product, G Data Total Security, has enough to please users who want a feature-packed suite, while still being simple enough that you’re not overwhelmed. G Data Total Security is priced at $45 for a single device for one year, or $65 for five devices per year. There isn’t a pricing option for 10 devices, which many other suites offer. G Data’s pricing isn’t bad and is probably one of the best at the five-device tier. But G Data’s pricing only covers PCs, whereas many other suites cover mobile and PCs. G Data’s mobile app for Android is sold separately at $16 per year for a single device. 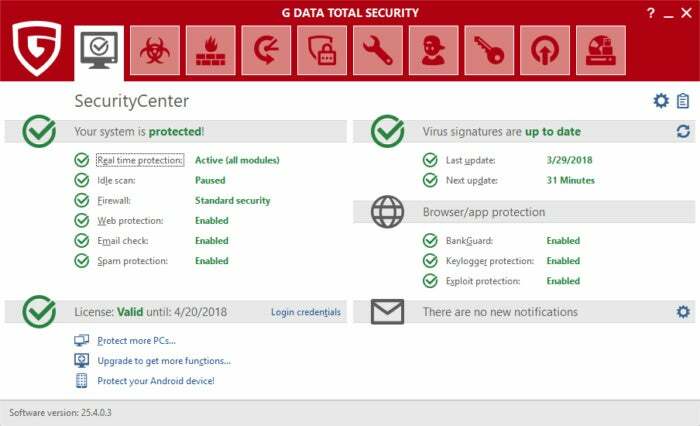 When you first start G Data Total Security for Windows it displays a dashboard called the SecurityCenter with your system’s current status. Like many other security suites, it uses a color-coding system. If everything is green in the SecurityCenter you’re good to go. There are three major sections on this page. The first indicates if your web, email, and spam protection is active, as well as when the last scan was. There’s also a section showing when the virus signatures were last updated, and when they’ll be updated again. If you want to update them sooner than that, just click the refresh icon for that section. Finally, there’s a browser and app protection section with features such as BankGuard and keylogger and exploit protection. All of these are invisible features that don’t really change your behavior. The BankGuard feature, for example, doesn’t try to launch a sandboxed browser but protects against threats in your current browsers. Diving into the rest of the suite, there are nine other tabs at the top of the Total Security window: Virus protection, Firewall, Backup, Password Manager, Tuner, Parental Controls, Encryption, Autostart manager, and Device control. G Data Total Security’s Virus protection section. 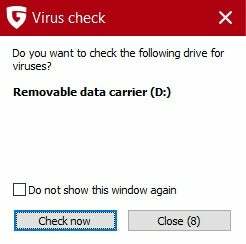 The Virus protection section is where you can manage your virus scanning schedule or start a manual scan. There’s also an option to check for deep-level malware by scanning system folders, RAM, startup files, and doing a rootkit check. You can also get access to your quarantined files here, and create a bootable drive to scan your computer for viruses. The latter option is a great idea as a backup measure—it will save the day should you ever get hit with a particularly nasty bit of malware. The Firewall and Backup tabs are pretty self-explanatory. The backup feature allows you to back up a drive, or a particular file or folder. The Password Manager tab prompts you to create a new password safe and then install a browser plugin for Chrome, Firefox, or Internet Explorer to access your passwords while browsing. Total Security’s Tuner is highly customizable. Parental Controls lets you set content restrictions for specific users on the current PC. That’s a helpful feature, but there doesn’t appear to be an online component that lets you manage all PCs from one spot. Perhaps that will appear in a future release. The Encryption option lets you put sensitive documents in an encrypted container. The Autostart manager tab is just a slightly easier interface for controlling which programs begin at startup. Windows 10 users, however, don’t really need this as the Task Manager can accomplish the same thing. 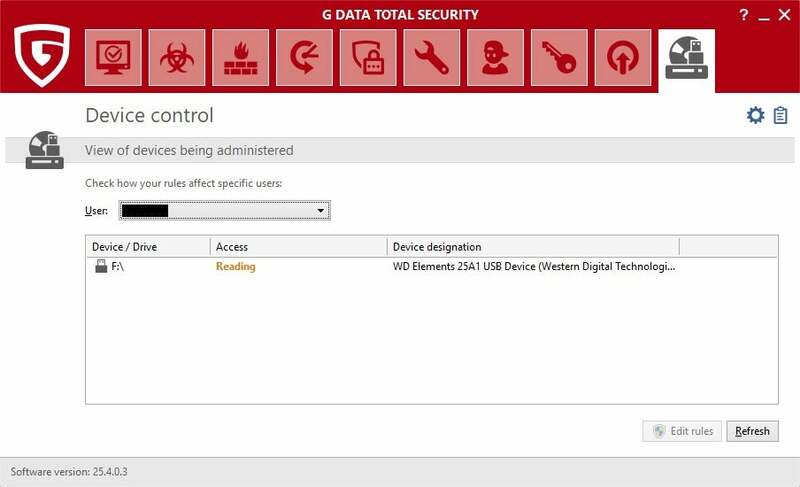 Total Security’s Device control lets you restrict who can save files to connected drives. Finally, Device control lets you regulate how users on the PC can access connected drives. Mom and Dad could be allowed to store files on an entertainment content drive, for example, while the kids would have read-only access. Diving into settings, there isn’t a whole lot you need to adjust. By default, G Data offers to scan flash drives inserted in your USB ports. There’s also a USB Keyboard Guard that protects against USB devices that may pose as a keyboard and try to deliver malware to your PC surreptitiously. Beyond that you have the usual adjustments you can make to your virus scans, web protection, email, and spam settings. G Data performed quite well in A-V Test’s evaluations. In April 2018, G Data’s lower-tier Internet Security scored 98.9 percent against 196 samples of 0-day, and web and email threats. The larger test with 5,484 samples scored 100 percent. G Data was not part of recent analyses by A-V Comparatives or SE Labs. G Data Total Security gives you the option to scan USB drives. In our in-house performance tests, G Data did alright but not outstanding. Without G Data installed, the test PC scored 2,487 in PCMark 8’s simulated workload, but 2,465 after G Data completed a full scan. A larger score is better in this test and while that’s not a terrible decline there are many other suites that don’t have a drop even close to that score. As for the Handbrake test, the test PC finished encoding a 3.8GB MKV file in one hour, 15 minutes, and 25 seconds. After G Data was installed that number improved to one hour and 15 minutes exactly. 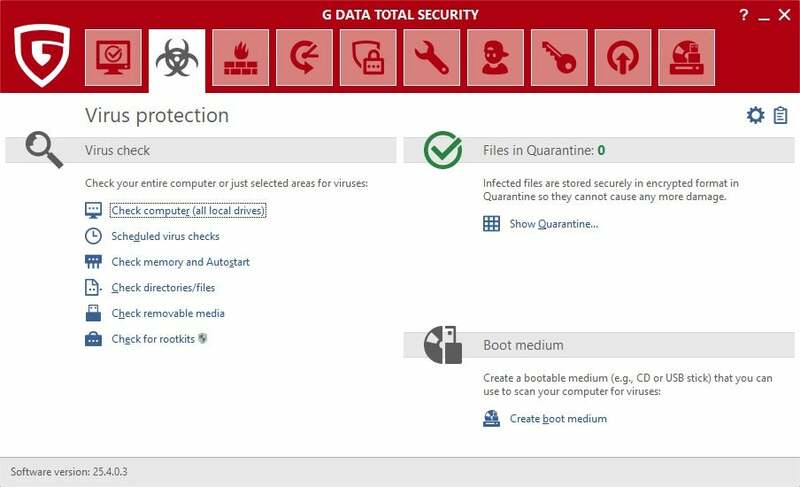 G Data is a fine antivirus suite. It’s really easy to use, comes loaded with features, and is priced fairly well if you only need G Data on your PCs. The performance is good and most users probably won’t notice an impact, but if you’re concerned about it there are other suites that have performed better. G Data is a well-organized and capable antivirus suite from Germany. It offers two malware engines for added protection, and is priced well. 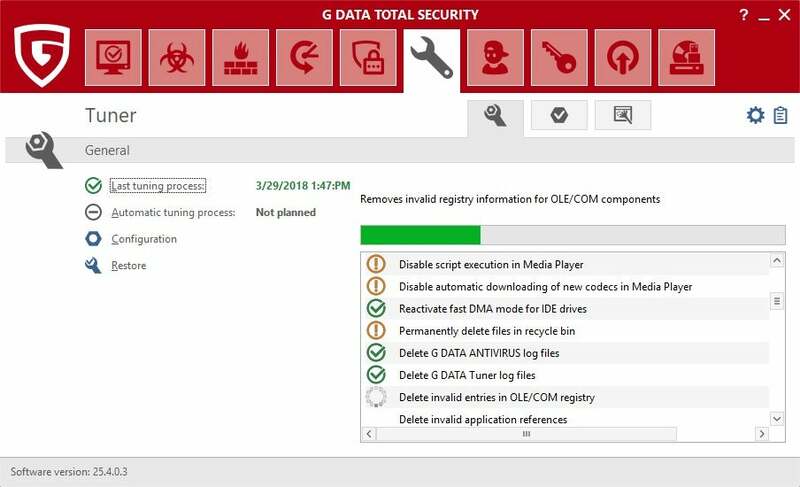 Although it's not as well known as other antivirus suites, G Data does a good job and the Total Security offering has plenty of features for those who want more than malware scans out of their security suite.